Arizona coach Bruce Arians is in favor of the league switching to full-time officials. Bruce Arians feels fortunate he’s not in the shoes of counterpart Jim Caldwell after Monday night’s non-call by the referees in Seattle potentially cost the Detroit Lions a victory. “I’d still be in the hospital, high blood pressure,” Arians said in a conference call Wednesday with Detroit reporters. “Every week now we have a call in a game that is determining outcomes of games." 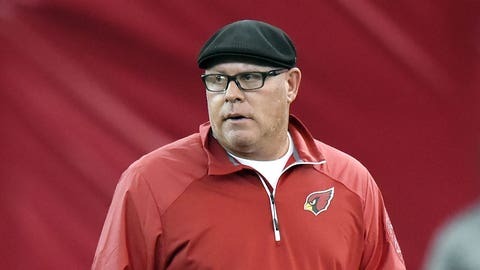 #Cardinals HC Bruce Arians said he would "totally" support full-time officials in the #NFL. Had the missed call happened against the Cardinals, Bruce Arians said he's still be in the hospital. Arians said he knew the controversial play in which Seahawks linebacker K.J. Wright batted the ball out of the end zone in full view of an official was illegal and warranted a penalty. He added that such a play points out the need for the league to employ full-time officials.